That time of year where we gather around the table with our families (most of which we don't like) and give thanks for the blessings we have been bestowed in our lives. We stuff ourselves silly with all the turkey, stuffing and pie we can handle, and then, just as fast, many will make their ways to the stores and some of the worst portrayals of humanity will be on full display as Black Thursday/ Friday shopping ensues. As hockey fans, especially here in Pittsburgh, we have much to be thankful for. Admittedly we have become a little spoiled and, at times, can forget just how different things could have been had fortune not favoured the bold....and the lucky. So let's give some thanks shall we? Give thanks to the city of Pittsburgh. You showed the NHL that the city could support a professional hockey team and have been rewarded handsomely. Give thanks to the past, those teams that struggled to keep the team relevant. Give thanks to the likes of Eddie Johnston and "Badger" Bob Johnson for their tireless efforts to make the club better. Give thanks for Mario Lemieux. For his career, his vision, and for keeping the team right where it belongs. Give thanks for Jaromir Jagr and his epic flow, and his charismatic goal scoring. Give thanks for the characters, that bring life to a team. For Phil Bourque, Chris Kunitz, Matt Cullen and Asst. Coach Mark Recchi. For Marc Andre Fleury and his pranks, Hal Gill for his chirps, and Matt Cooke with his... colorful nature. Give thanks for Pascal Dupuis, who showed us that sometimes being brave means giving up something you love and that family comes before anything. Be thankful for charity, and all the good the organization does for others. The smiles they bring to children, both healthy and less so. For the warm clothing and meals they provide to those in need, and the respect they give to our many veterans. Be thankful for postseasons, some teams will never see them. Be thankful for June, and game sixes on the road. Be thankful for 1991, 1992, 2009, 2016 and 2017 and even the years in between. Out of the darkness comes light, and the Pens are one of the brightest beacons of the NHL. Be thankful for Wilkes and for Wheeling. Without them, there are no call ups. Without them, there may not have been back to back Cup championships. Be thankful for the old as well as the new. For bygone eras and the outlook of the future. Finally, be thankful for yourselves, the fans. Be thankful that you have this team. Be thankful that you aren't Flyers fans. 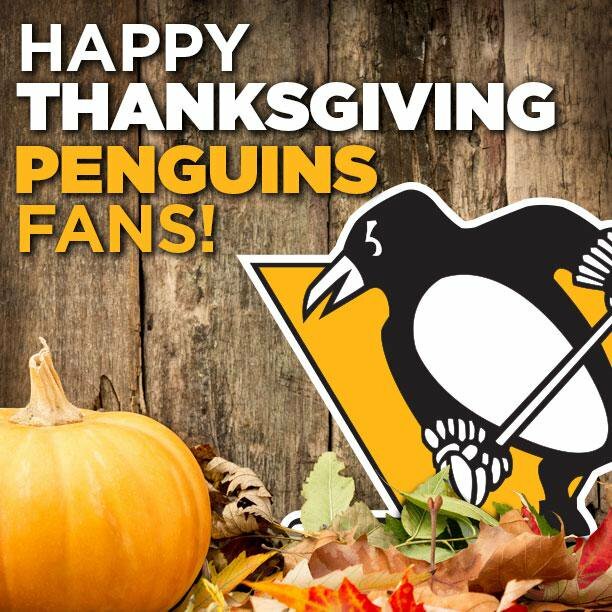 Be thankful for all that the Penguins have been, for all that they are, and for all that they will be.